Outdoor kitchen design is our specialty here at Outdoor Homescapes of Houston – especially when it comes to covered outdoor kitchen designs. So if an outdoor kitchen is what you’re looking for, have we got some beautiful designs for you! We make the process quick and easy with our “Design Services Roadmap” outlined on our “Outdoor Living Services” page. We just combine Steps 1 and 2 – a total of five to eight hours – for a shorter, one- to two-hour meeting. With its rustic stone, shelf decorations and ceiling fans, this outdoor kitchen is Texas to a ‘T’! expectations and budget for your outdoor kitchen. We also provide an overview of the design services process. In Step 2 (normally a separate, second consultation), we talk about the size, location, color and texture of components within your outdoor kitchen, including materials and appliances. 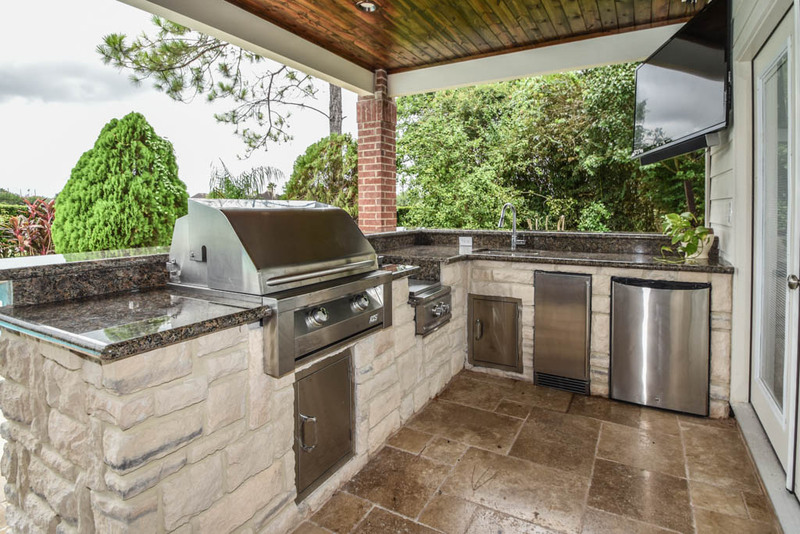 Typical design components of an outdoor kitchen include cooking and/or grilling areas, a sink, traffic and task areas (like floor and counter space) and storage areas. Many of these elements are often built into islands. We also discuss the functional elements your outdoor kitchen design may require, like electrical wiring, plumbing, utility supplies like gas lines and drainage. During this Step-1-and-Step-2 combined meeting, we also talk appliances. When it comes to cooking and grilling, we can install everything from high-end, professional-grade grills to ovens, double-burners, pizza ovens, smokers and Big Green Egg ceramic charcoal cookers. Other popular appliances for outdoor kitchens include stainless steel trash drawers, dishwashers, refrigerators, freezers and Kegerators. Popular materials include natural or manmade stone, tile and stamped/designer concrete flooring. Take a look through our private online library of outdoor kitchen plans, outdoor kitchen photos and material samples. 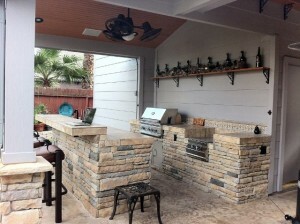 You can also find great ideas for outdoor kitchens on your own at Houzz, the Huffington Post and HGTV. We’ll then discuss your ideas, style, functional and design preferences and come up with a plan for your outdoor kitchen – together! The fee for these drawings, blueprints and specification sheets is usually $900 or less, depending on the complexity and detail your outdoor kitchen requires. Contact us – and get started today!